Current events can serve as a vehicle for teaching students skills tested on standardized tests -- reading comprehension, reading maps and charts, interpreting political cartoons, recognizing bias, supporting opinions with facts, and so on. Current events also help students to connect to their own community and to the wider world by learning what is happening in that world and why it is important to them. Students can demonstrate this knowledge through various presentations and projects. Teaching and Learning with The New York Times (Overview Start Page) provides free and accessible content from The Times and from all linked content, without a digital subscription. 14 Ways to Use the Learning Network is an overview of the program -- reusable activity sheets like Times Bingo, a Connecting The Times to Your World reading log, a Cause and Effect organizer, a fun photo activity, and worksheets for close reading, primary-source analysis, and comparing texts. The Teaching Topics Index collects links to special lessons by curriculum, as well as interdisciplinary units such as Teaching with Infographics or All about Food. Test Yourself Questions focus on news stories from different curriculum areas each day. WGOITP (What’s Going on in This Picture?) -- My personal favorite asks the same three questions every week to develop visual literacy. Student Opinion Writing Prompts with 200 Prompts for Argumentative Writing collected on one page. Text to Text pairs literature to current events -- A Raisin in the Sun and “Discrimination in Housing Against Nonwhites Persists Quietly,” The Prince and “Why Machiavelli Still Matters,” Huckleberry Finn and “In Defense of a Loaded Word,” Romeo and Juliet and “Montague and Capulet as Shiite and Sunni,” but there are also connections to essays and news stories for science, mathematics, and more. Poetry Pairings does the same thing for poems and news stories or videos. And, of course, there is the Word of the Day and On This Day in History, and Student Crossword Puzzles. PBS NewsHour has Daily Videos (also archived) and Lesson Plans by curriculum areas. Rather than focus on current events, PBS POV Documentaries with a Point of View focuses on in-depth documentary films, with Lesson Plans and online Video Clips. There is also a DVD Lending Library. The National Archives has Special Topics and Tools, such as HistoryPin which is connected to Google Maps so that students “witness” history, a YouTube Channel for Educators, Today’s Document. and Document Analysis Worksheets. Online Newspapers offers thousands of world newspapers in six different languages. Takes some clicking to get to what you want. World-Newspapers.com has its own twist on various online mnews sources. A Periodic Table of Visualization Methods -- Wow! The National Archives has document analysis worksheets, including one on cartoons. Download fillable Acrobat generic worksheet. American Association of Editorial Cartoonists (AAEC) has a weekly political cartoon lesson (and a blank cartoon for students to try writing their own captions). There are 267 lessons on individual cartoons! 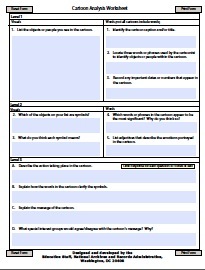 Download Introductory Worksheet (pdf). TeachingHistory.org has background worksheets with examples. Also includes an article on additional resources. 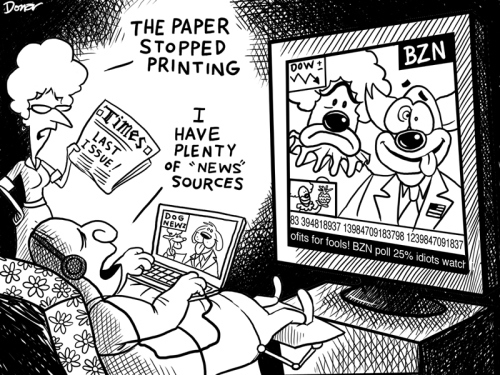 Download Packet (pdf) on cartoons with six examples to analyze. MSNBC has Daryl Cagle’s The Week in Cartoons. It’s No Laughing Matter at the Library of Congress offers an in-depth approach. And, if you want your students to create their own political cartoons, EdTechTeacher reviews eight creation sites and includes tutorials. Current Event Analysis Worksheet (Tyler): Uses 5Ws & H, vocabulary study, and paraphrase. Current Events & History (Boyd): Asks students to research a current event and detrmine whether it will become history. Current Events (Effinger): Uses 5Ws & H, prediction, and a visual interpretation. Periodic Table of Visual of Visualization Methods -- best of the best! Innovative Design in Education -- One of the best overviews of Infographics, with links to good examples and useful creation tools. The Do’s and Don’ts of Infographic Design -- Sophisticated graphic advice. 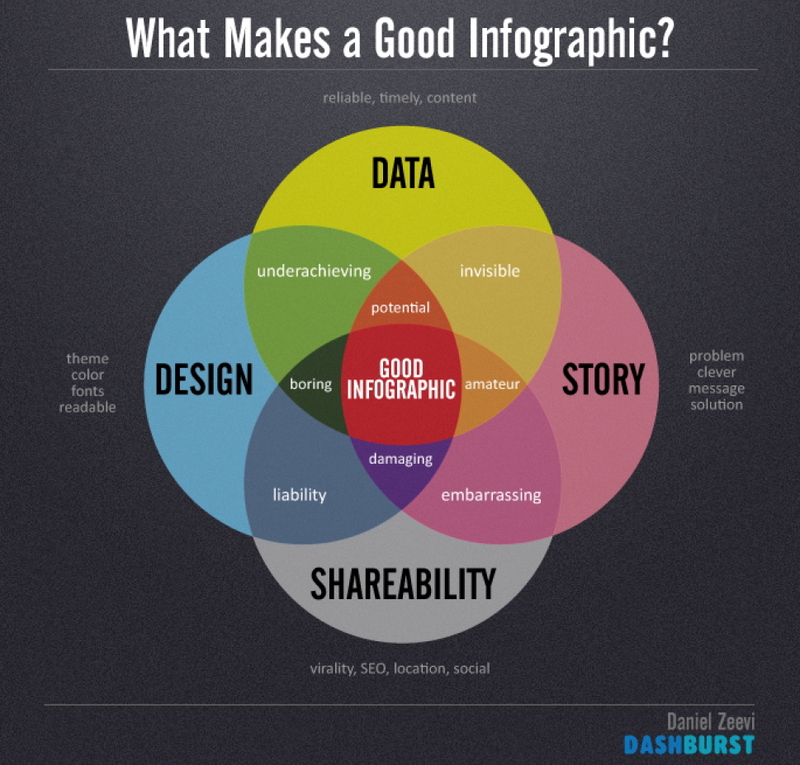 Do-It-Yourself Guide to Infographics -- Straight-forward approach to beginning infographic study. Has a marketing slant, but advice is useful. 20+ Tools to Create Your Own Infographics -- Extensive article reviewing free and paid online creation sites and software. Includes links to tutorials. Beyond the Book: Using Infographics for Students’ Reading History is one teacher's process on using infographics with junior high students. No matter what project you choose, this one is a good start. 40 Insightful Infographics -- wide range of samples in different curriculum and business areas. 22 Mind-blowing Infographics on Education -- each could be used as a mini-lesson in itself. Infographics for Teaching and Learning -- samples could serve as models for student infographics. Simple Guide to Creating Infographics in Powerpoint website uses sophisticated templates and examples, with clear directions. 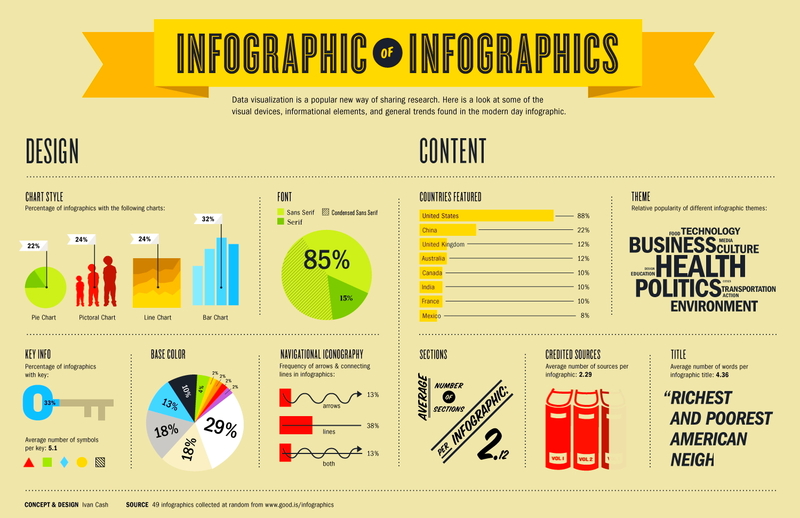 Marketer’s Simple Guide to Creating Infographics in Powerpoint also includes a PowerPoint. 5 Tips on Using PowerPoint for Infographics is a simple approach. Simple Powerpoint Templates offers simple vectors and images for use. Complex Powerpoint Templates presents more options.